Applicants for admission must be at least 16 years of age, of good moral character, and must pass a satisfactory examination in arithmetic and algebra as far as factoring, or present a certificate of graduation from a grammar school. Evening Classes. The school year for these classes begins the first Monday in October and ends the second Friday in May. Examinations for admission are held the first Monday in June and the last Monday in September, at 7 PM. Courses of instruction: General technique, jewelry and silverware designs, building construction, theoretical and applied electricity, electroplating, plumbing, electric wiring, machinists, and moulders. 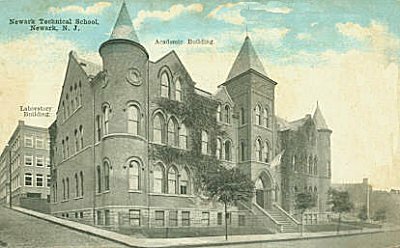 The Newark Technical School at 363-371 High Street was organized in 1884. Here all branches of technical instruction are given, the institution being conducted by eight trustees, among whom are the Governor of the State and the Mayor of Newark.